John Delaney was reportedly just 150 feet from the peak of Mount Everest when he died Saturday, having collapsed from an unknown medical condition. 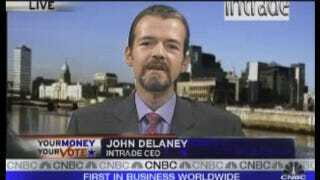 The Intrade founder passed away without knowing he had a new daughter. He was 42. Delaney, the first Irishman to perish on Everest, had tried the summit once before five years ago, around the time of his marriage. This time he made it up 29,000 feet, and his guide had already gone ahead to the mountain's peak, when Delaney collapsed. The guide returned, and doctors were consulted by radio, but Delaney could not be resuscitated. He leaves behind not only his wife and new daughter, born last Wednesday, but two young sons, as well. His company, Intrade, bills itself as "the world's leading prediction market" and make bets on the outcomes of "hundreds of real-world events." Delaney surely foresaw that he'd miss the real-world event of his daughter's birth during his climb; that he'd miss her life entirely was presumably an unanticipated tragedy.